Between January and June 2017, ATAI delivered a three-part dissemination series organized by Technical and Operational Performance Support Program (TOPS Program), a U.S. Agency for International Development-funded learning mechanism, and hosted at Save the Children’s office in Washington, DC. 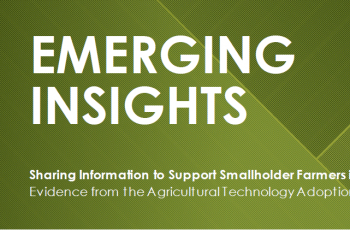 These sessions introduced USAID grantees and other attending implementers to ATAI’s approach to testing strategies to increase technology adoption among smallholder farmers. All the presentations and accompanying webinars are available online through the Food Security Network’s website. The first session on January 30 focused on “Randomized Evaluations in Practice: Opportunities and Challenges.” This talk introduced the methodology randomized evaluations, and involved a discussion on what makes them powerful and what lessons can be drawn from them. 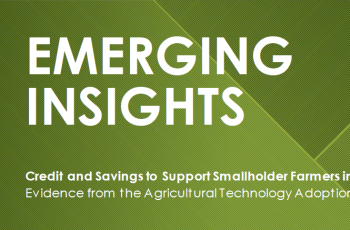 The subsequent sessions presented evidence on two of four constraint areas discussed in ATAI’s Emerging Insights series: credit & savings, and information. The second session on April 11, “Reaping Greater Impacts in Agricultural Extension,” reviewed results from evaluations on agricultural extension, social networks, and improving the pedagogical method of extension services. The talk covered the theoretical motivation for ATAI’s work on this area, and highlighted encouraging examples of farmer field schools using ICTs to reach farmers directly and increasing their effectiveness. The third session on June 22, “Credit for Smallholder Farmers,” discussed smallholder farmers’ credit needs, why traditional microcredit does not always meet them, and to share results of rigorous research (funded by the ATAI) that tested tailored credit products to better fit the context of smallholder agriculture.